Ages 9 through 17. 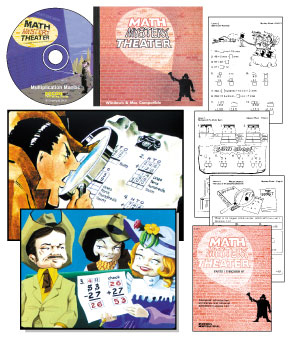 Fascinating math mysteries teach and reinforce basic math skills development. These lessons allow students to review math fundamentals on the computer and on reproducible student exercise sheets. Rich color, exciting sound effects and humorous plots encourage learning and retention of skills. Self-directing and self-correcting lessons can be completed in 20-40 minutes depending on student ability. One copy of the complete activity book is included FREE. Fun for all ages. Windows/Mac CD-Roms. Build or review crucial math skills. Find out why this outstanding program is being used with special learners throughout the country to build basic math skills. The CD titles include Multiplication Maniac, Case of the Dazzling Diamonds (Division with 1-digit divisors), and the Great Numbers Bank Robbery (prime and composite numbers). Important NOTE: No more than 1 set per customer may be ordered at this special price!